I was already a fan of Richard Thompson before the first time I heard him in person. That event occurred in St. Petersburg, Florida, more than 20 years ago. My wife and I were vacationing in the area and when I heard that Thompson was playing I had to go to hear him. When we arrived at the venue we were considerably unimpressed. It was a seedy-looking bar with a total of one chair in the entire place. We got there early enough to secure that chair, where my wife sat sipping white wine and waiting for something worthwhile to happen. That took quite a while. The show started late, and opened with a local woman folksinger who had nothing worthwhile to offer. After a few minutes, my wife Tara started looking at me and mouthing, “Let’s get out of here.” I insisted we wait. Once Thompson began singing, Tara took my hand and beamed. Since then, I’ve heard Thompson in three different nearby venues. He performed once with his band at the Bearsville Theater, which seats about 250 people, three miles from my home. The place was packed. He’s also performed once at the Bardavon 1869 Opera House in Poughkeepsie–the theater where Ed Wood got his start in movies, as an usher. That place seats almost a thousand people, and it too was full. Most often, we have heard him at The Egg, a complex of two theaters in Albany. He performed, with and without his band, at the larger Carlisle Theater, which also seats almost a thousand (and has no bad seats). The hall was never sold out, but it was usually about 90% full. Then again, maybe the problem was that Thompson was performing the following night at the Mahaiwe Theaterr in Great Barrington, Massachusetts, about half an hour away…. Still, what is there left to say about this man? Probably nothing new, but I’m inspired to rehash anyway. 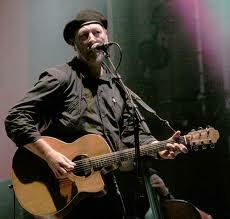 I think Richard Thompson is one of the most remarkable performers I’ve ever heard. Usually, when I hear a singer-songwriter-instrumentalist, one of those aspects is most outstanding and the others follow behind. Not with this guy! He is one of the greatest guitar players I have ever heard, and he’s not limited by any genre. While he does have a basic folk style, he plays it with more elaboration and virtuosity than anyone else I can think of, and he’s just as adept as a rock guitarist. (Some day I’d like to hear him try a movement of Bach. He obviously has the chops.) In one of his performances at The Egg, an obscure but highly amusing Frank Loesser version of “Hamlet,” he gave a convincing impersonation of a 1940s jazz guitarist. He sings with tremendous power and range, with breath control an opera singer might envy, and his diction is among the clearest I’ve ever heard. And as a songwriter, he is one of the geniuses of his time. Many other performers use his songs, often to great effect, although it’s rare that anyone can outdo Thompson in his own material. His lyrics are memorable, and his melodies are accompanied by harmonic and rhythmic complexity far beyond the ambitions of most songwriters. At this show, I was especially struck by a song called “Pharaoh,” which sounded as though it had been written as a theme song for the Occupy Wall Street movement (which I had joined, although at Wall Street in Kingston, New York, earlier the same day.) It wasn’t until I got on line that I discovered the song was first recorded in Thompson’s album “Amnesia ” in 1998!